National Weather Service chart shows forecast high temperatures for Saturday. The San Diego region can expect a warm weekend, with daytime temperatures rising 5 to 10 degrees above normal on Saturday. 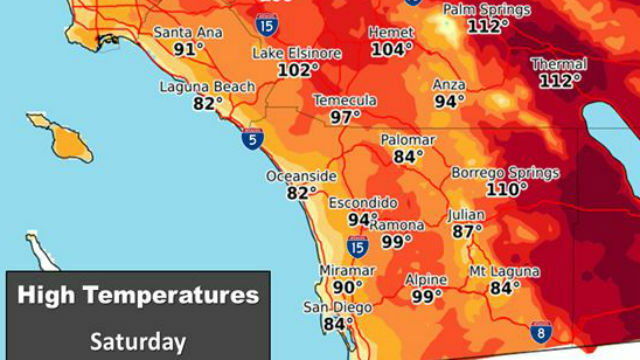 The National Weather Service office in San Diego said the inland valleys will see highs from 100 to 105 degrees, while the mercury will climb above 110 in the lower deserts. “Portions of the inland valleys and the lower deserts are expected to approach critical thresholds, and some locations could reach critical thresholds for periods of time on Saturday,” the weather service said. The highs will be a few degrees lower on Sunday, and a gradual cooling trend will begin Monday and continue through the middle of next week. The heat is due to high pressure over the eastern Pacific Ocean that is expanding eastward into Southern California.